The Emory Eagles defeated the University of Chicago on Sunday to win the Intercollegiate Tennis Association National Indoor Championship for the second year in row. The No. 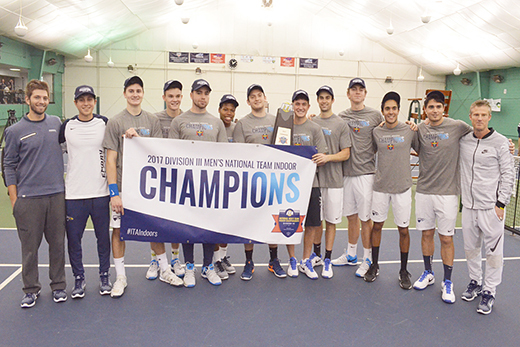 2-ranked Emory men's tennis team defended its title by beating the University of Chicago in the finals of the Intercollegiate Tennis Association National Indoor Championship in Cleveland, Ohio, on Sunday. The Eagles raised their spring record to 5-2 following a 5-1 triumph over the No. 5 Maroons, who fell to 9-1. The championship marks Emory's second consecutive ITA Indoor title and the Eagles' seventh first-place finish in the 17-year history of the event. After trailing in doubles in their first two matches over the weekend, the Eagles took a commanding 3-0 lead in the final match after sweeping that portion of the competition. The No. 3 team of junior David Omsky and sophomore Jonathan Jemison got things rolling with an 8-3 victory before sophomore Adrien Bouchet and freshman Max Renke posted an 8-5 verdict over Tyler Raclin and Max Hawkins at No. 2. Senior Rubinstein and sophomore James Spaulding closed out doubles at No. 1 with an intense 9-8 outcome, prevailing in the breaker, 8-5, over Ninan Kumar and Erik Kerrigan. Bouchet put the Eagles ahead, 4-0, following his 6-2, 6-4, triumph over Charlie Pei at four singles, raising his spring record to 4-1. Senior Aman Manji recorded the clinching point at No. 1, bettering David Liu, 6-3, 6-1. The Maroons accounted for their lone point at No. 2. Emory went into the ITA National Indoors as the No. 1 seed while Chicago was the No. 3 seed. The Eagles return to action on Friday, March 17, when they host Millsaps College at 2 p.m.